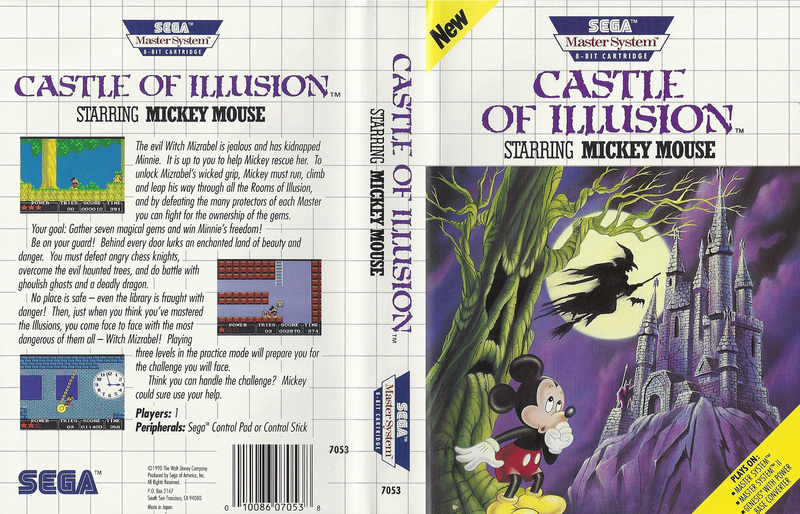 Castle of Illusion - Starring Mickey Mouse / Castle of Illusion - Estrelando Mickey Mouse / Castle of Illusion (마법의 성) - USA All sides - Scans - SMS Power! The evil Witch Mizrabel is jealous and has kidnapped Minnie. It is up to you to help Mickey rescue her. To unlock Mizrabel's wicked grip, Mickey must run, climb and leap his way through all the Rooms of Illusion, and by defeating the many protectors of each Master you can fight for the ownership of the gems. Your goal: Gather seven magical gems and win Minnie's freedom! Be on your guard! Behind every door lurks on enchanted land of beauty and danger. You must defeat angry chess knights, overcome the evil haunted trees, and do bottle with ghoulish ghosts and a deadly dragon. No place is safe - even the library is fraught with danger! Then, just when you think you've mastered the Illusions, you come face to face with the most dangerous of them all - Witch Mizrabel! Playing three levels in the practice mode will prepare you for the challenge you will face. Think you can handle the challenge? Mickey could sure use your help.